Comes in clear display box with fact card in back! This highly collectible and adorable carded porcelain figurine is a unique piece of art. 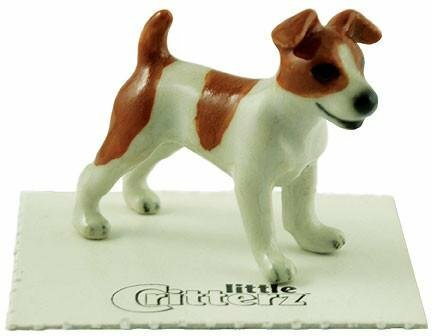 It takes a lot of experience, skill and attention to each tiny detail to produce this wonderful jack Russell figurine. Each miniature is entirely hand-painted by talented artists using a very thin brush with only a few hairs. Every piece is high-fired and subjected to rigorous quality control. This process guarantees the purity of the colors, the perfect shape and the sharpness of every detail. Each porcelain animal figurine makes a perfect gift for your friends, family or yourself and a treasured and delightful addition to any collection.